Dr. Nima Mashkouri defines and shapes his role in dentistry by keeping patients happy and healthy. Open communication is encouraged by his friendly personality and consideration for each person's needs. All the while his patients comfortably relax in a stress-free environment while he works efficiently and effortlessly to make each visit a pleasant one. At Paradise Dental we provide excellent and ethical services. We make every effort possible to take care of your oral health; to create a comfortable, pleasant environment for all; to make procedures pain-free; to see you leave the office satisfied and with a smile, and to return knowing you can count on us. General Dentistry, Cosmetic Dentistry, Restorations, Root Canal Therapy, Implant Dentistry, Invisalign Orthodontic Treatment, Laser Teeth Whitening, Oral Surgery, Wisdom Teeth Extractions, Periodontal Care, Sleep Apnea and TMJ related treatment. We do not charge for emergency x-rays or exams ! We only charge when we fix your problem. Emergencies are seen promptly, every day ! Paradise Dental offers a wide variety of family dental services to residents in Santa Monica and surrounding cities including, but not limited to West Los Angeles, Westside, Venice, Pacific Palisades, Brentwood, Mar Vista, Sawtelle, Culver City, & more. "I recently moved to Santa Monica and was looking for an endodontist in the area, and chose to go with Dr. Nima Mashkouri because of his exceptional Yelp reviews and ratings. Thank you Yelp for leading me to a highly intelligent, professional, personable, and understanding doctor." - Kim R. on Yelp! "Dr. Nima is absolutely wonderful. He truly takes the time to care about each patient individually. He explained exactly what he needed to do in a way that made me calm and comfortable. He works very quickly and efficiently! I have never met a dentist that is so knowledgable and kind. My son had to have a root canal at age nine. Dr. Nima made sure his comfort was the number one priority. I left feeling confident that Dr. Nima would be our family dentist from this day forward!" -Alice T. on Yelp! "Dr. Nima is an amazing dentist. He is super friendly and makes you feel welcomed and taken care of. His staff is very easy to work with and the office is immaculate. Even on the things insurance didn't cover, all prices are very reasonable and the work is top notch. There is a surgeon in the same office, so he really is a one-stop shop for all major dental work. I had a deep cleaning, and several fillings. Everything turned out perfectly. And he went to UCLA so you know you're getting quality ;) I plan on returning here for years to come." - David S. on Yelp! "I wasn't at a dentist for years, because I did not find and trust any doctor. But I knew I had to go and I can't thank enough the person who introduced me to Dr. Mashkouri. I went and just from the beginning to the end it was the best experience I ever had my life at a dentist. I had no pain at all. Dr. Mashkouri made sure I feel nothing. He did a crown procedure with no pain at all. He made me belive again and looking forward to my next treatment. Then I know I am taken good care of and my teeth are going to be in great shape." - Gregor R. on Yelp! "A very best experience ever at Paradise Dental in Santa Monica Ca. I had a bad experience at other dental places in the past, which in my mind everytime I will hear "dentist" there was a remark about pain, pain, pain. At Paradise Dental with Dr. Nima my experience was the best very careful during procedure no pain at all and very professional, overall Dr. Nima cares about your well being plus it is a very comfortable place to be and very friendly attentive staff. Thank You! Dr. Nima for changing my expectation and my confidence toward my dental experience again. I recommend anyone who is looking for a Dentist you won't regret it, you will thank me for this recommendation trust me! :) :) :) :) :)" - Jaime C. on Yelp! 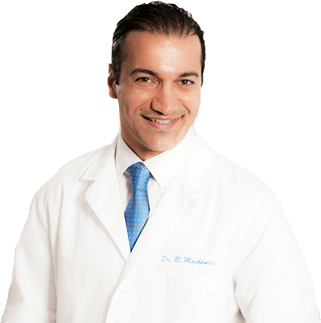 "I am so grateful to have found Dr. Mashkouri. After being told that I needed a root canal, I was terrified. Like everyone else, I am apprehensive about needles but thanks to his gentle touch, my root canal procedure was painless. He and his wonderful team are very professional, yet personable. I highly recommend Paradise Dental! They really care about their patients." - Darlene S. on Yelp!